Limited Supply! These tangerine coloured blooms planted en masse will fire up any patio deck. The barbeque might just get jealous! 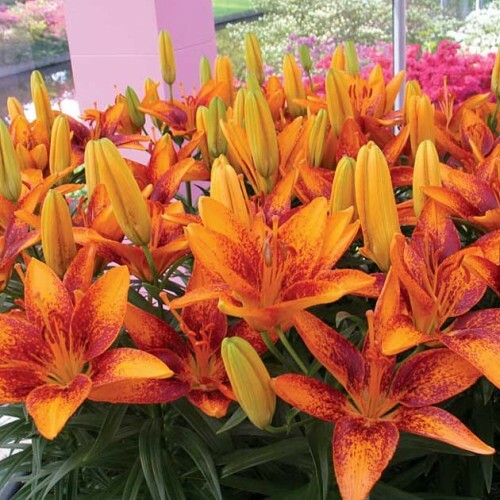 Asiatic Patio Lilies are shorter, dwarf versions of the standard Asiatic Lily. Their blooms, however, are just as large and the flower petals are somewhat more succulent. The new Tiny Collection was bred for more blooms, improved colour and stronger stems. This means brighter, longer lasting flowers for you! These prolific little bloomers can be grown in pots and containers but there's nothing stopping you from planting them in the garden along borders and at the front of your flower beds. They like a rather heavy soil with an ample supply of humus and good drainage. Remove faded flowers and do not cut back stems until autumn. Bulbs should not be lifted but left in the soil to bloom annually for many years.